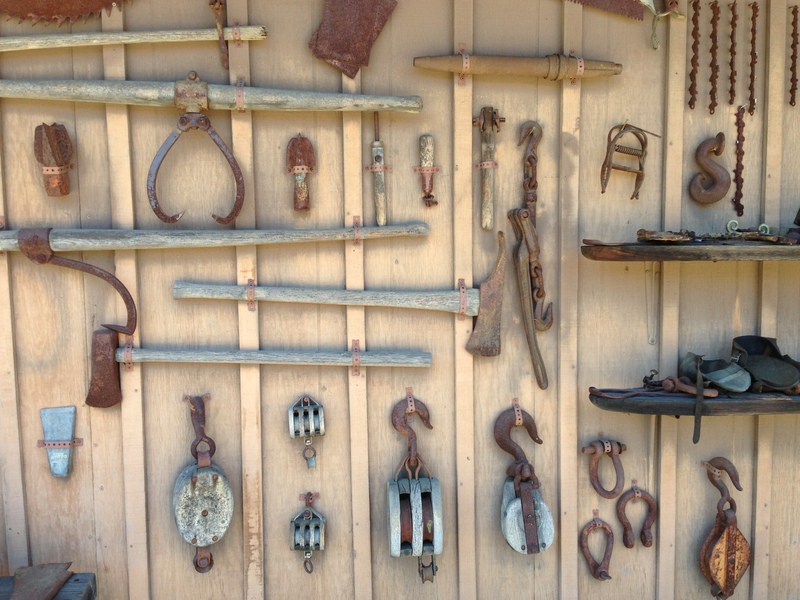 Outside of the historical agriculture exhibit at the Santa Cruz County Fair I have never seen so many antique farm implements and tools. Vintage tractors and parts were tucked underneath massive black walnuts. The winding driveway was dotted with more equipment, tractor wheels and parts. 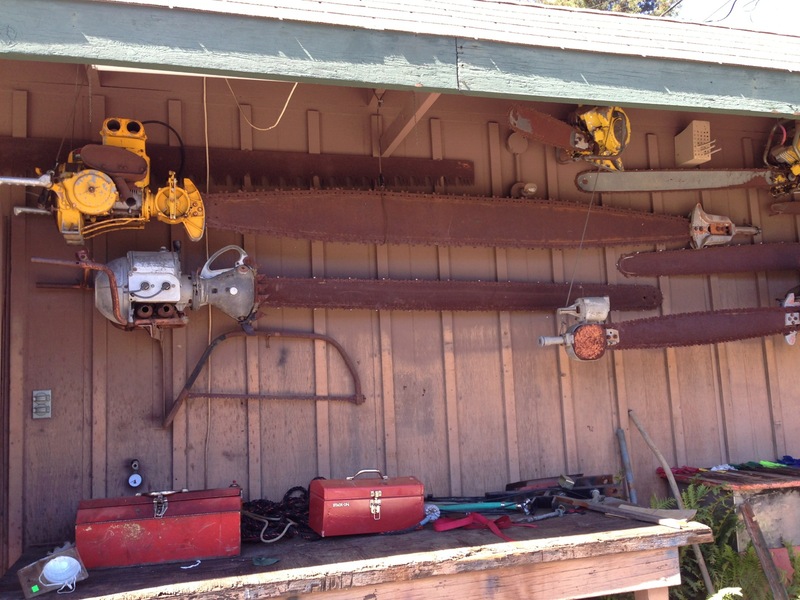 A storage shed displayed a collection of vintage chain saws and other small tools. California poppies bloomed in small clusters. I was here to visit an old friend in the hills above south Felton near the Toll House resort to see if I could help with advice about his ailing plum trees. Al HIley has lived in this idyllic location since he was a boy and that’s a long time as his 92nd birthday is this month. His father bought the 18 acres in 1906. The original house still stands shaded by a grape vine arbor that protects the door and windows in the heat of the day. He lives close by in another house where he enjoys a vista which includes Mt. Umunhum, the Summit and Boulder Creek. Al says he used to be able to see downtown Felton but the redwoods have grown since the late 1800’s when this area was logged. I had to laugh that Al was asking me for advice. He’s been farming this land starting since WWII ended. His father p lanted the original walnut trees in the hopes of making a profit from his land but “he was no farmer”, according to Al. I glanced at the catalogs on the 12’ long redwood burl coffee table. You can tell a lot about a person from what they read. Strewn about were several tractor catalogs, Popular Mechanic magazines, Heartland cata logs, miscellaneous tool catalogs and a book entitled ‘Chainsaws: A History” which touts to be the first book on the worldwide history of the chainsaw. 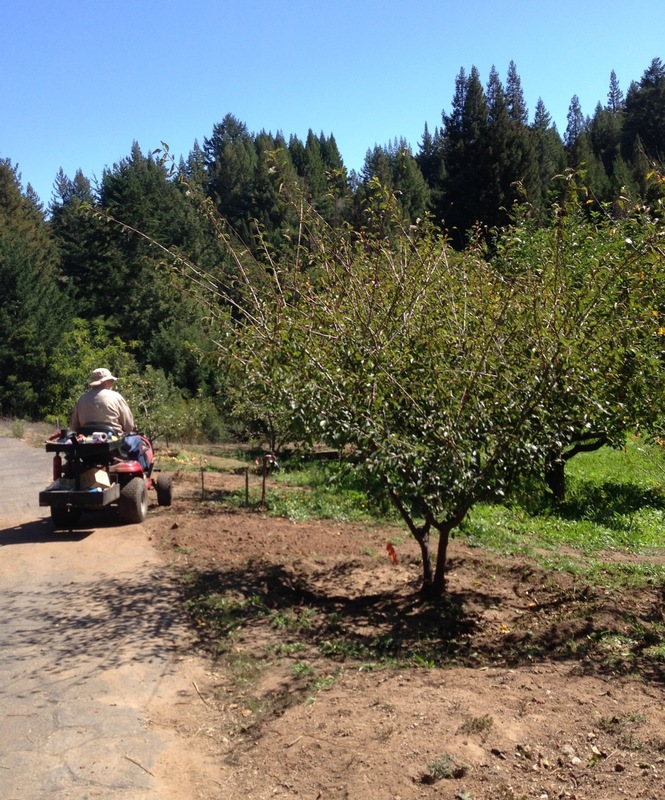 With his lab, Sonny, at his side, Al and I went out to the orchard to take a look at the fruit trees. Originally in the 1960’s he had about 95 fruit trees. 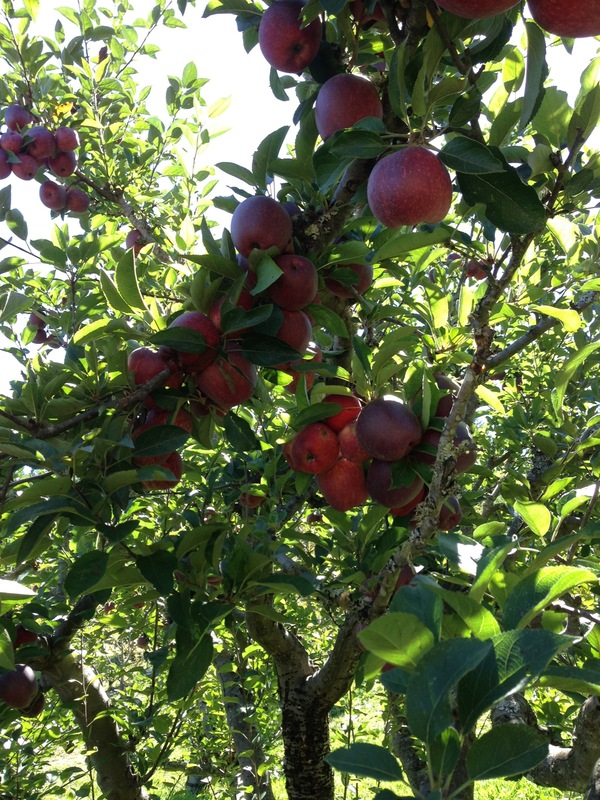 He grafted different kinds of apples onto his father’s trees and planted peaches, and pears as well as plums and prunes. We passed the blueberry bushes which were starting to show some fall color. Nearby grew a fig with a gnarled trunk the likes I have never seen. Loaded with hundreds on hundreds of ripening figs he invited me back to pick some when they ripened. Al couldn’t verify the exact variety of red apple that caught my eye. It also was loaded with beautiful fruit. He got me a bag to pick as many as I wanted to take home and they are crispy and juicy. He grows a yellow delicious apple also but after eating the red variety I didn’t think anything could rival them. The plum trees weren’t doing as well. They all had some yellow leaves and golden colored sap oozing along the branches. 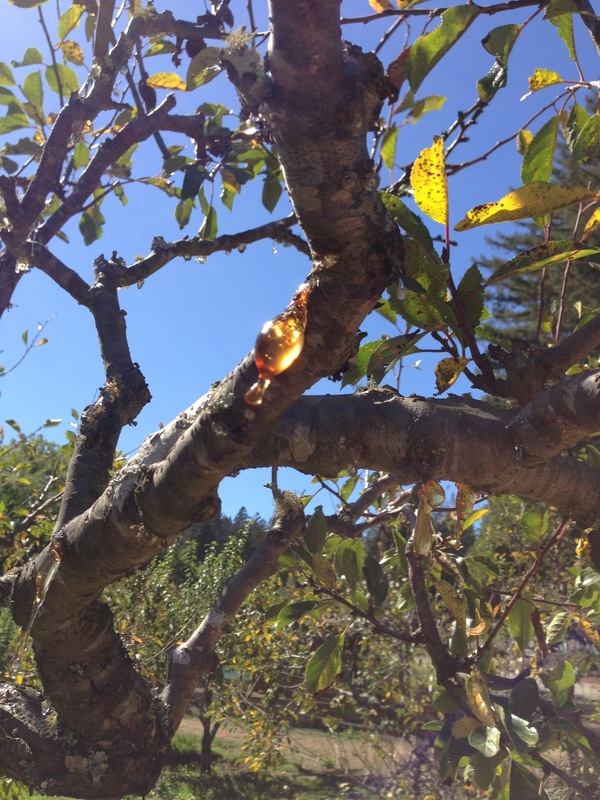 This condition is called gummosis and occurs often in stone fruit trees like cherry, apricot, peach and plum. It can be caused by several very different things. The tree may have gumming from a pathogen that invades and kills bark and cambial tissue through a wound such as a pruning cut, sun scald or hail. If you scrape the outer bark under the sap the dead phloem will appear cinnamon brown in color Prevention is the key to managing this problem. Keep trees healthy with optimal watering, mulching and nutrition. Borers can also cause gumming. In a plum tree, weakened trees or places where wounds have occurred will be susceptible. Ooze is often clear. Management of these pests is difficult and may include bark sprays during the growing season. If you are not sure that a pathogen is causing the gummosis, scrape the outer bark away. If the inner bark is still cream colored and healthy, the oozing is caused by non-living factors and there is nothing you should do. If the wood is tan to brown, it is dead, and was most likely killed by a pathogen. For my friend, Al’s plum trees I determined that the gummosis was caused by excessive irrigation. Due to the drought, Al had tried to limit watering during the summer. When he saw the trees being stressed he deep watered several times in the past month or so. The apple trees loved it but not the plums. He is happily going to deep water much less often until the trees go dormant. I left Al and Sonny with the promise that I’d be back when the figs ripened. I’m sure I’ll be needing a fresh supply of apples, too.